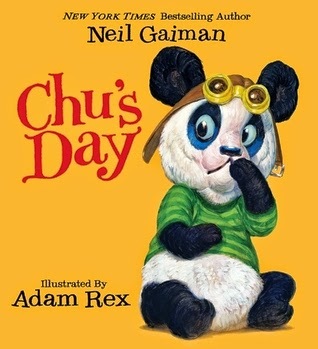 Chu’s Day by Neil Gaiman (illustrated by Adam Rex) is a charning board book, perfect for beginning readers or those who are too young to read on their own. The main character is an adorable little panda named Chu. Chu has a problem! When he sneezes, everything in the room gets messed up! He goes to various locations, such as the library, a diner, and the circus. At the library and the diner, he manages to hold in his sneeze. But at the circus—WATCH OUT! He sneezes so hard that the tent falls down and so does everything else! Not to mention that his sneeze is SO powerful that it even affects the diner and the library. Adam Rex’s illustrations are just adorable, and little ones will have a great time observing what changes Chu’s sneeze makes to his surroundings. They will also have great fun pretending to sneeze, just like Chu. what a good book! Thank you very much !